Batman’s undergone countless permutations in thousands of comics over the last eight years. 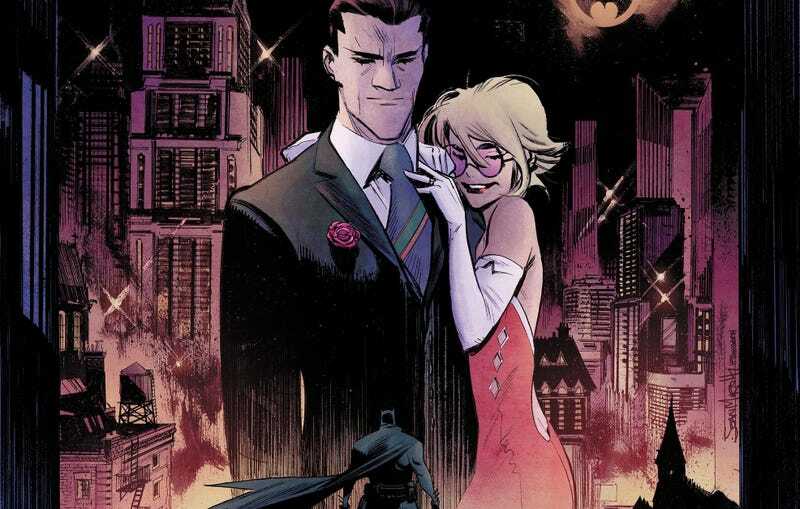 Yet for all that storytelling, the actual politics of a Gotham City protected by an obsessed vigilante has been an under-explored notion—and it’s one Sean Murphy’s going right to the heart of in Batman: White Knight. The third page of Batman: White Knight #1 serves as an introductory statement of intent, letting readers know that the usual conventions aren’t going to be rolling out here. Batman sits sourly in an Arkham Asylum cell until he’s visited by his former archenemy, now cured and treated with deference by police officers. We see the beginnings of the Joker’s unlikely rehabilitation in the rest of the issue, which involves Batman acting out in an especially brutal fashion. When I sat down with series creator Sean Murphy at New York Comic Con last week, he wanted to talk about social commentary, where the former killer clown’s journey is going to take him, and who pays for all that superfight property damage in Gotham City. io9: I wanted to start by asking about the social commentary and police brutality angles in issue #1. Is that an intentional part of the design or just the framing for presenting the Joker as a hero? Sean Murphy: Yes, it’s intentional. I wanted to touch on BLM and some issues that are ripped from the current headlines. There’s even some gun control stuff there, later. But I wanted to write it as a centrist with characters on both sides. I didn’t want to beat anyone over the head with politics. I’m super left and I wanted to play that down. To reach across the aisle. io9: “Centrist” is kind of a dirty word now. Murphy: I know, yeah. But it’s all intentional. I’m using Duke Thomas in my book, too. He reps the Bed-Stuy of Gotham. And cops won’t go there so he’s taking matters into his own hands. Kind of a Luke Cage-like vibe. io9: Is he a former Robin or something like that? Has he been trained by Bruce and whatnot? Murphy: No. He’s a cop and carries a gun. He won’t give it up. He’s like, “I know Bruce, I know guns have hurt you but they’ve helped me.” Like I said, I’m trying to imagine a “both sides” scenario here. io9: Staying on police brutality, you’re basically treating Batman an avatar for state-enforced violence. So what are the real world conversations you’ve had that are influencing the story? On one hand, you’re de-coupling it from a race-centric perspective, which is where a lot of the police brutality conversations happen. But at the same time, it’s an issue that affects everybody. Murphy: You know, one of the helpful things was, I have these two newscasters in the story, one who was more conservative and one who’s more liberal. One’s black and one’s white. I have them talk about what’s going on in a Frank Miller-style way, where they disagree on what this is and what’s offensive. So when Joker—Jack Napier, now—gets a groundswell of support from this mostly black community that’s been unrepresented, people are upset. io9: As long as you know that. There’s a lot of talk about cultural appropriation these days, and how characters from different backgrounds get used in narratives. It’s all very fraught. But you’re saying you know that. Murphy: Yeah. I have a thick skin. After Punk Rock Jesus, I got death threats from Christians. I think I’m prepared for this. io9: So what kind of politician is Jack Napier? What’s his party line? Murphy: He wants to represent the middle and lower class who are unrepresented, who don’t have enough resources. When Jack gets freed in issue two—spoilers—he takes the settlement from the city and uses it to build a library in the Bed-Stuy of Gotham. Trying to help people out with these social programs, a club where kids can go. io9: He sounds like a New Deal Democrat. Murphy: Could be! He gets groundswell support from that community but doesn’t run for mayor or anything big, just city council. But it gives him enough of an edge where he has a say and he really leverages that to lash out at the one percent. He finds out that when Batman destroys a neighborhood, there’s public funding that brings that neighborhood back. So these rich people would buy [property] after Batman’s destroyed a neighborhood. There’s one-percenters making money off Batman’s crimes and Batman isn’t even aware of this. Murphy: But why wouldn’t that actually happen? When Batman finds out, he’s upset. He’s not a villain [in this story] because he’s a one-percenter. He’s mad because [it’s] his own friends at these cocktails parties. That they would even do that, you know? io9: How else does the Joker plan to change Gotham? Murphy: Eventually he decides Batman is a liability and he needs to be arrested. There’s an accident that happens. Batman interferes with the police and it’s such a huge problem that they need to do something. And they don’t want to arrest him. But they need him out of the way for a little while. io9: He needs a Bat-intervention. That stuff in the first issue where Nightwing and Batgirl complain to each other about how he doesn’t even listen was so great. Murphy: He does need one. Because he’s not listening to anybody. Eventually Batgirl and Nightwing can’t reach out to him. Alfred’s not there. io9: Your version of Bruce is far more maladjusted than the very maladjusted Bruce is in the mainline continuity. Murphy: He’s having a bad day. He’s just frustrated. How many times can you capture the Joker, have him say all these weird things to you in front of everybody... eventually you just snap. You have to snap. Murphy: So, Alfred is in a coma from issue one. And Bruce is helping keep him alive by using Mr. Freeze tech. Alfred’s out of the picture, and it’s kind of why Bruce is having this moral crisis. So when Nightwing and Babs find out about this, it starts to [make sense as to] why he’s losing it. Because Alfred is his father. Batman: White Knight #2 is due out on November 1.